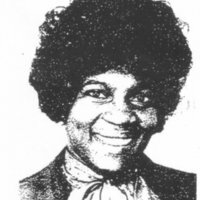 This is a photo of Bronx CORE member Judith Jones, a former chairman of the chapter's of the division. 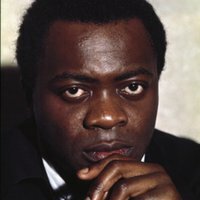 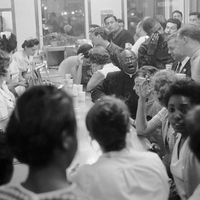 This is a night time photo of CORE member Ed Lewinson (front, White male with dog) and Yaphet Kotto (front, Black male, white shirt, tie), at Bronx CORE's White Castle demonstration, July 11, 1963. 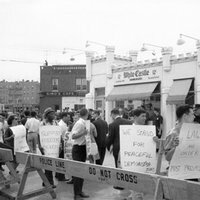 This is a day photo of Bronx CORE's White Castle demonstration on July 13, 1963. 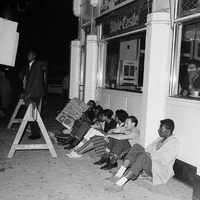 This is a photo of CORE members sitting in at the White Castle restaurant Bronx CORE used as a demonstration site to protest against the chain's lack of Black and Puerto Rican employees. 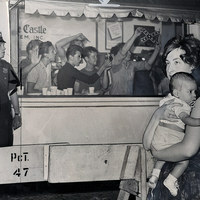 This is a photo of counter protesters at Bronx CORE's White Castle demonstration. 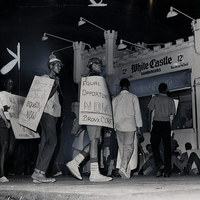 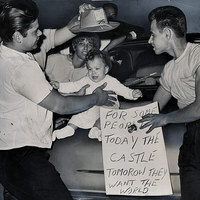 This is a July 7, 1963 night time photo of Bronx CORE's White Castle demonstration. 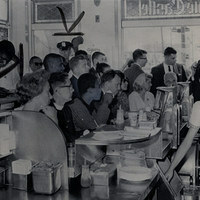 By the time this photo was taken, several 'scuffles' had already taken place. 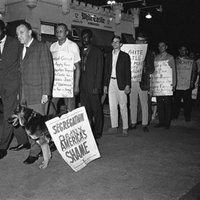 The crowd of spectators and counter protesters had grown to more than a thousand.